One Times Square, which for over 100 years has hosted one of the world's most iconic New Year's Eve celebrations, will this year reel in more than $23 million from ad revenue. According to the Wall Street Journal, the mostly empty office building is a booming business thanks to ad deals with the likes of Toshiba, Dunkin' Brands and Anheuser-Busch. These brands pay a hefty price for the privilege of being front and center as the ball drops each year. 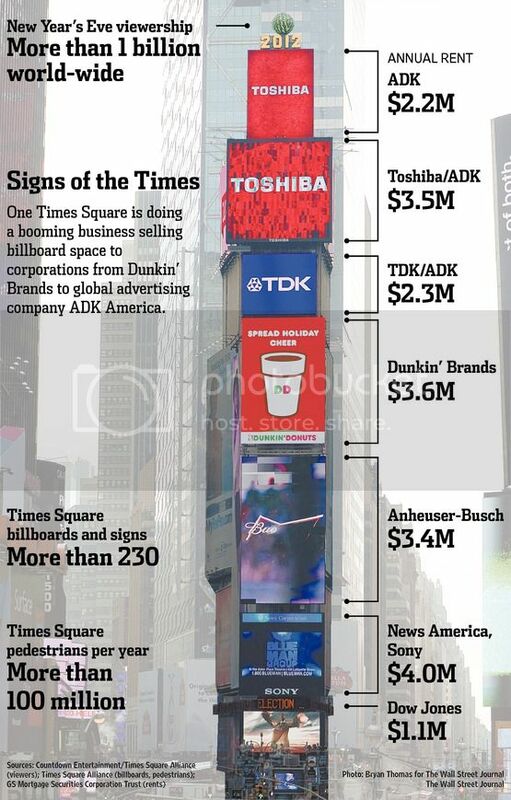 For some brands, the reach and caché of being seen at "The Crossroads of the World" is worth what most experts estimate is the most expensive outdoor signage in the world. "There's a statement we make in being there—and we think the placement we've got is outstanding," said Blaise D'Sylva, VP, Marketing at Anheuser-Busch told WSJ. "We had to sell a lot of ramen before the billboard paid for itself," said Linda Chung, assistant vice president of marketing at Nissin.